Tommy Wright believes St Johnstone can create history if they can maintain their fine form up until the Scottish Cup final against Dundee United. The Perth side have gone seven games unbeaten after their 1-1 draw away to second-top Aberdeen in the Premiership. "I am really pleased going into the last three league games and with the Cup final to look forward to," he told BBC Scotland. "If we can maintain that form, we can finish the season on a high." The second-placed Dons were St Johnstone's semi-final victims as they reached the climax of the Scottish Cup for the first time. "We're delighted to be in the final, we think we've got a great opportunity to create a bit of history for the club, but there's a long way to go," said Wright. 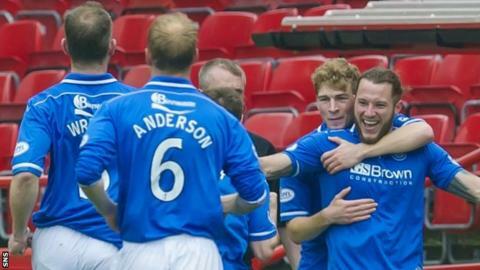 On this occasion, Stevie May's opener was cancelled out by Adam Rooney. "Aberdeen have been outstanding all season. particularly strong at home, and that's the second point we've picked up here," said Wright. "Both sides will probably feel they could have stolen it in the end, but I think, overall, a draw was a fair result. "It keeps the run going and, overall, we put in a good performance. "The players have lifted their level of performance and have been consistent with it." Scotland Under-21 striker May revealed in midweek that he plans talks with the club despite having only signed a one-year extension in October. "We contacted his agent about three or four weeks ago," revealed Wright. "He didn't get back to us because he did not want to bother Stevie at the time of the Cup semi-final. "But he has spoken to Stevie and Stevie has said in the press that he's more than happy to sit down and talk to us. "That will take place in the coming weeks. I don't think it's going to be one meeting and he's going to sign a new contract. "But the good thing from our point of view is he's indicated he would like to extend his contract, which is good news for St Johnstone."